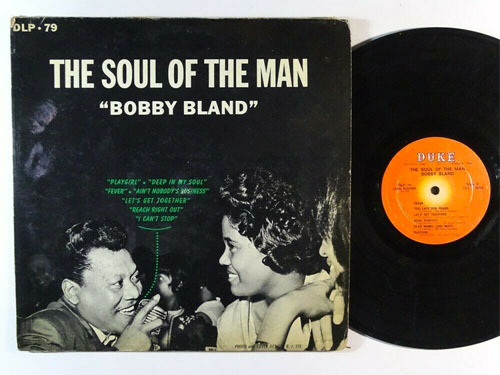 Check out these new and used Bobby Bland vinyl records LPs for sale. Bobby Bland, also known as Lion of the Blues and Sinatra of the Blues, created a sound that combined gospel blues and R&B. He has been here described as “among the great storytellers of blues and soul music who created tempestuous arias of love, betrayal and resignation, set against roiling, dramatic orchestrations, and left the listener drained but awed.” Bobby Bland, or Robert Calvin Brooks, was born in Tennessee in 1930. In the early 50s, he recorded albums for Sun Records and Duke Records, but struggled to find himself artistically. In 1952, he joined the U.S. Army which put his music career on hold. He returned to Memphis in 1954 and ended up signing an unfair deal with Duke Records which only gave him half a cent per album sold. Along with Bill Harvey and Joe Scott, he began to create the big band blues hit singles he is known for today. Bobby’s first success on the charts was Farther Up the Road which reached number one on the R&B chart in 1957, and his final successful single was 1963’s That’s the Way Love Is. Bland continued to perform until his death in 2013 at the ripe old age of 83. We recommend starting your Bobby Bland vinyl collection with his essential album Dreamer.